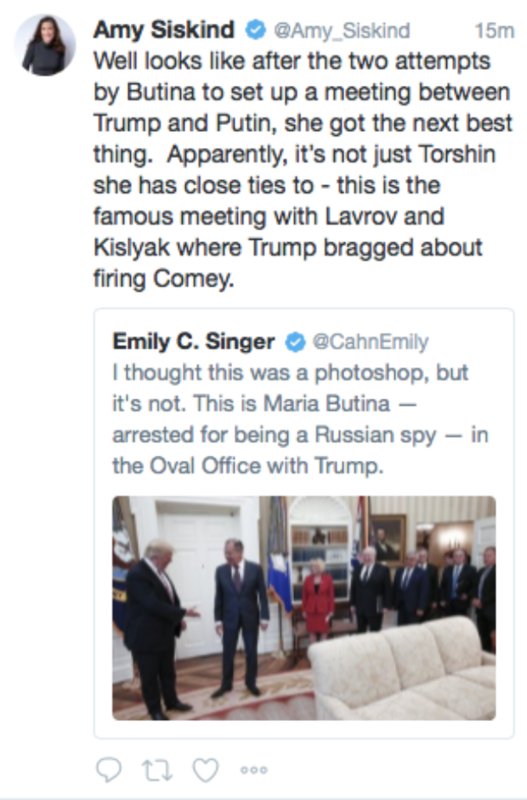 Mic writer Emily Singer misidentified a woman in an Oval Office meeting as a Russian spy on Tuesday, racking up thousands of retweets before having to delete the false information. 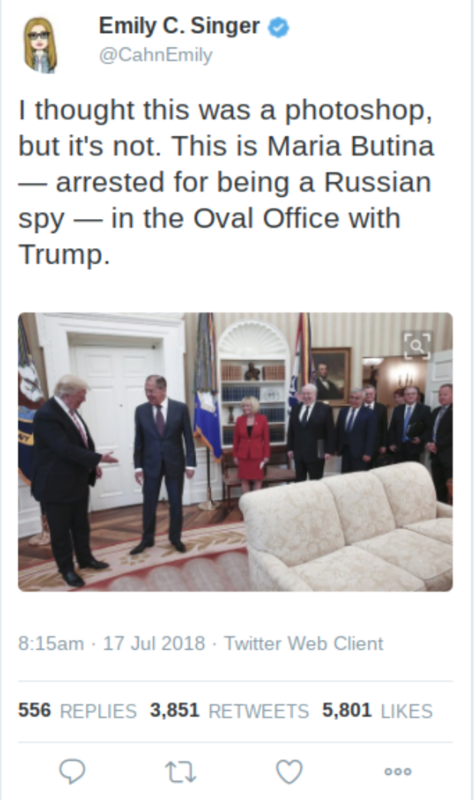 Singer tweeted out a photo of Trump in the Oval Office with Russian diplomat Sergey Lavrov and claimed Maria Butina, who was charged with being a Russian agent this week, was also present at the meeting. Singer’s evidence was that there was a redheaded woman (Butina is a redhead) standing in the back. Singer’s tweet had close to 4,000 retweets and 6,000 likes before she realized she had jumped the gun. 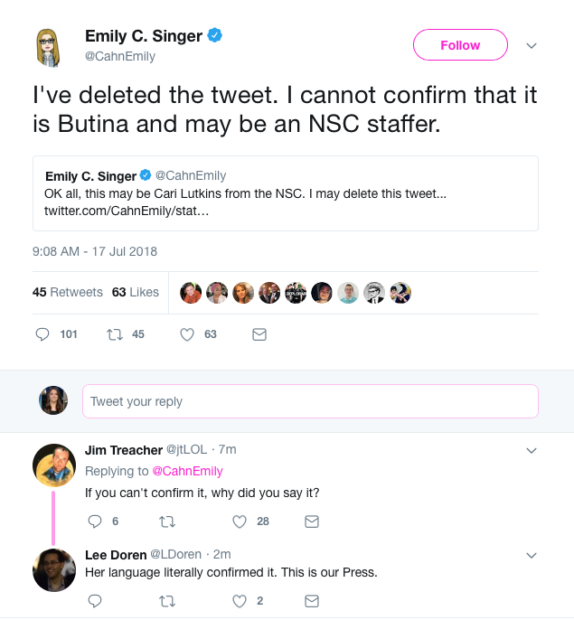 Singer finally deleted the tweet because she could not “confirm” that the person in the photo was actually Butina. Several high-profile Twitter users, including Vox’s Matthew Yglesias and author Amy Siskind, had already shared the misinformation on their own feeds. Yglesias deleted his tweet and explained that the woman is not Butina, but Siskind’s tweet has not yet been deleted. The actual woman in the photo is NSC staffer Cari Lutkins, The Daily Caller was able to confirm. 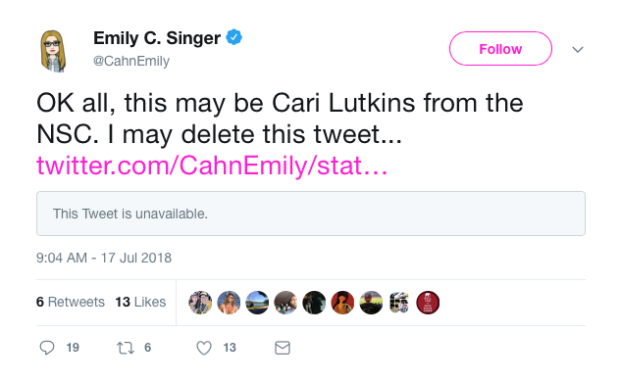 TheDC reached out to Singer for comment but did not receive a response by time of publication.